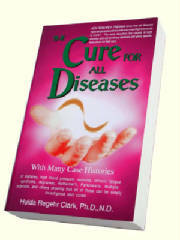 From Dr Clark's Book "Cure For All Diseases"
Other toxins are also present, such as aluminum, mercury, freon, thallium, cadmium. Aluminum buildup is seen in all Alzheimer's sufferers (100%). This is undoubtedly part of the true cause. Did it come before or after the parasites? Start a kidney cleanse as soon as you can. Follow this with a liver cleanse. Clean up environment and diet. Your beloved family member or friend with Alzheimer's can regain his or her mental functions to a considerable degree. Most important is stopping the mental deterioration before it is not reversible.